The Skywatch Mages Guild is a guildhall located in the city of Skywatch. It is a two-story Altmer-style building with a spacious outdoor area. Most of the residents can be found here, including the majority of the creatures. A magus tent run by Selenor Illoro is set up on the right of the front door. Behind it there can be a locked chest. Inside, the main floor contains a bunk bed separated by the folding screen and four bookshelves. The magister and the mystic of the branch reside on this floor. A letter, To My Reviewer, authored by Falarel, can be found here along with Notes on Bewan, a note which adds a map marker to the Bewan ruin. Behind the folding screen there can be a safebox, breaking into which counts as crime. One more bed and a bookshelf is upstairs, where Soothsayer Erralle and Kupkin spend all their time. Most of the containers in the guildhall are owned, excluding a few of those found outside. Several Guild Savants could be encountered on the premises, resting, socializing or practicing Magic. Quite a few unique cats reside in this guildhall. * Encountered here at the beginning of Messages Across Tamriel. 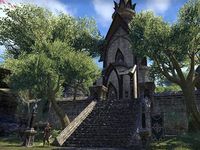 ** Accompanies Gaireth after the successful completion of the Take Me Home quest.